CANTON, Mass., ORRVILLE, Ohio, and WATERBURY, Vt., Feb. 26, 2015 -- Dunkin' Brands Group, Inc., (NASDAQ: DNKN), The J.M. Smucker Company (NYSE: SJM) and Keurig Green Mountain, Inc. (Keurig) (NASDAQ: GMCR) today expanded their partnership by signing agreements for the manufacturing, marketing, distribution and sale of Dunkin' K-Cup® packs at retailers nationwide in the U.S. and Canada, and online. Dunkin' K-Cup® packs are presently available in Dunkin' Donuts restaurants in the U.S. Keurig is the exclusive producer of Dunkin' K-Cup® packs and will remain so with the expansion of the partnership. The J.M. Smucker Company currently manufactures and distributes Dunkin' Donuts® brand premium bagged coffee where groceries are sold under license from Dunkin' Donuts. Under the new, multi-year agreement, Smucker will distribute and market Dunkin' K-Cup® packs exclusively to grocery chains, mass merchandisers, club stores, drug stores, dollar stores and home improvement stores. 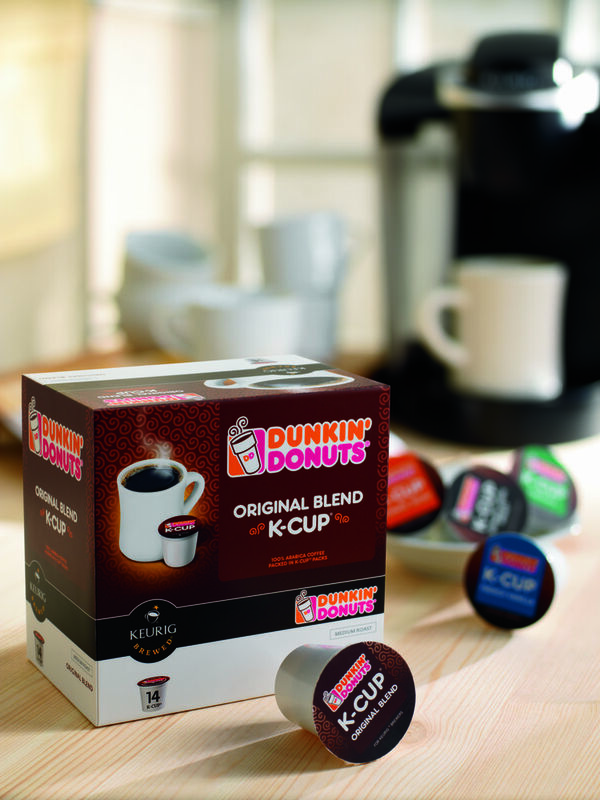 Keurig will distribute and market Dunkin' K-Cup® packs to specialty stores and office superstores. Dunkin' K-Cup® packs will continue to be available in Dunkin' Donuts restaurants in the U.S. The expanded retail program launches in the middle of 2015 with five varieties of Dunkin' Donuts' signature coffee initially available in K-Cup® packs, including Original Blend, Dunkin' Decaf, French Vanilla, Hazelnut and Dunkin' Donuts Bakery Series Chocolate Glazed Donut flavor. Also beginning this spring, Dunkin' K-Cup® packs will be sold online on www.DunkinDonuts.com, www.OnlineStore.Smucker.com, www.Keurig.com and other online retailers. "This exciting new agreement with two trusted and long-standing partners, The J.M. 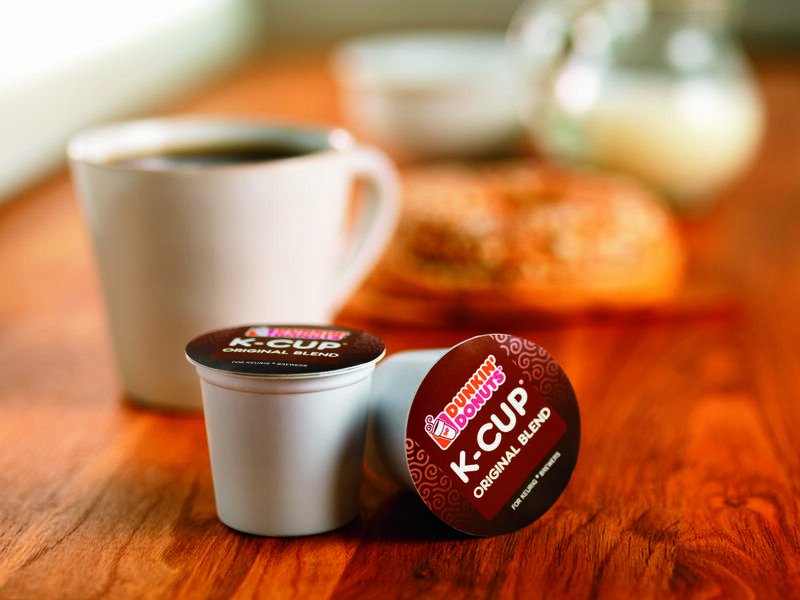 Smucker Company and Keurig, will make Dunkin' K-Cup® packs available at thousands of additional retail outlets nationwide, as well as online, and will enable us to further tap into the growing consumer demand for single-serve at-home coffee," said Dunkin' Brands Chairman and Chief Executive Officer Nigel Travis. "Not only will this increase the consumption ofDunkin' Donuts coffee, it will help us continue to build our brand relevance with new and existing customers, which we believe will, in turn, drive incremental visits to our restaurants." "The wait is nearly over for the many Dunkin' Donuts coffee fans who have requested we add Dunkin' K-Cup® packs to our at-home single-serve coffee offerings," stated Richard Smucker, Chief Executive Officer of The J.M. Smucker Company. "The expansion of our relationship with Dunkin' Brands andKeurig allows us to satisfy this consumer need by bringing Dunkin' K-Cup® packs into new retail channels, including wherever groceries are sold. The addition of Dunkin' K-Cup® packs will further strengthen our Smucker coffee portfolio as we work with our retail customers to continue to bring excitement and new growth opportunities to the coffee category." "Expanded availability of Dunkin' K-Cup® packs will make it possible for even more consumers to experience and enjoy this great-tasting, beloved coffee while at the same time building consumer awareness and passion for the Keurig system," said Brian Kelley, Keurig President and CEO. "Our unique ability to partner with Dunkin' Brands, J.M. Smucker and more than 60 other brands has helped Keurig, an innovative technology-driven personal beverage system company, to revolutionize the at-home and away-from-home beverage experience, bringing more than 400 high-quality beverage varieties to Keurig consumers with the consistent simplicity and convenience they've come to expect from the brand." Terms of the respective agreements with The J.M. Smucker Company, Keurig Green Mountain and Dunkin' Brands were not disclosed. Concurrent with its expanded partnership with Smucker and Keurig, Dunkin' Brands also announced today details of a new franchisee profit-sharing program as part of a long-term deal under which Dunkin' Brands will equally share with qualified U.S. Dunkin' Donuts franchisees its net profits from the sale of its K-Cup® packs and packaged coffee from outlets outside of its restaurants. "When we introduced Dunkin' K-Cup® packs as a retail item in our restaurants in 2011, we said we would only consider allowing this product to be sold at other retailers if we could do so in a way that benefitted both us and our franchisees," Travis said. "In keeping with that commitment, I am delighted to announce that we have been able to reach a profit-sharing agreement with our domestic Dunkin' Donuts franchisees that we believe will drive incremental, profitable growth for both Dunkin' Brands and our franchisees." For more than 115 years, The J.M. Smucker Company has been committed to offering consumers quality products that bring families together to share memorable meals and moments. Today, Smucker is a leading marketer and manufacturer of fruit spreads, retail packaged coffee, peanut butter, shortening and oils, ice cream toppings, sweetened condensed milk, and natural foods products in North America. The Company remains rooted in theBasic Beliefs of Quality, People, Ethics, Growth, and Independence established by its founder and namesake more than a century ago. For more information about the Company, visit jmsmucker.com.